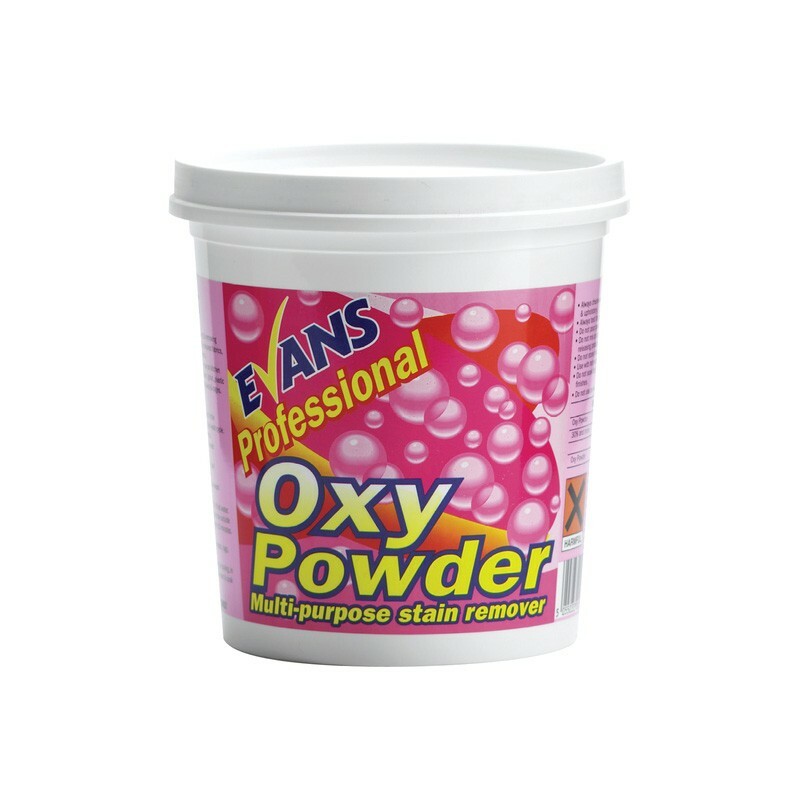 Evans Oxy Powder is a highly effective, multi purpose powder for cleaning and removing stains, grease, mould and heavy soiling from white and coloured fabrics, upholstery and carpets. It is extremely versatile, as it is also suitable for use on kitchen worktops, chopping boards, toiles, paving stones, grout, plastic, garden furniture, rubbish bins and even animal baskets and cages. Removes the most difficult stains including fruit juice, coffee and tea. Suitable on white and coloured fabrics. Ideal for use wherever bleach is not acceptable. Supplied in a convenient 1ltr bucket with scoop. Full case pack size - 6 x 1kg tubs. Wash Booster: Add 1 scoop (25g) to the detergent in the washing machine drawer in the main wash cycle. For heavy soiling use 2 scoops. Soaking: Dissolve 1 scoop (25g) in to 1ltr of hot water. Stubborn stains use 2 scoops. Colours - soak for a maximum of 1 hour. Whites - soak for up to 6 hours. After soaking rinse with cold water or wash as normal. Carpets, Upholstery and Textiles: Dissolve ½ scoop (12.5g) in to 1ltr of hot water. Dab stain with solution, working from the outside of the stain to the centre and leave for 10 minutes. Wipe clean with a damp cloth. Do not use on wool, wool blend carpets, rugs, silk, leather or suede. Cleaning Mop Heads: Dissolve 1 or 2 scoops, depending on soiling, in a bucket containing 2 litres of hot water and soak for 1 hour or overnight. Difficult Stains: As it is a powder, you can make a solution to a strength to match the problem.